Canada’s economic and strategic interdependence with the United States makes Canada an important priority for the People’s Republic of China in realizing its geopolitical goals. There is increasing concern by Canadian intelligence agencies that Canadian politicians, civil servants, and policy advisers are subject to Chinese political influence. There is also significant evidence that Chinese diaspora communities, especially the Chinese language media in Canada, are subject to intimidation by agents of the Chinese state. In response to persistent political pressure by agents of the PRC, the government of Canada has authorized transfer of technology developed in Canada with significant innovative military applications to Chinese state-related concerns. The government of Canada is receptive to Chinese political pressure due to strong imperatives to diversify Canada’s economic dependence away from the United States in light of uncertainty over the future of NAFTA. The Chinese government holds out the promise of better access to China’s large market if Canada complies with China’s political and economic foreign agenda. Historically, Canada’s affinity for the PRC has been informed by the urgency on the part of anglophone Canada to stave off the seductive challenge of US technology and free market ideology. At the time Canada was negotiating the terms for diplomatic relations, China was providing support for the Viet Cong forces that were killing Americans. Many Canadians including Prime Minister Pierre Elliott Trudeau had considerable sympathy for Mao’s policies of proletarian cultural revolution, largely disregarding their illiberal, repressive character as if China was seeking a distinctive society and economy consistent with Chinese cultural norms, just as Canada was seeking to maintain its distinctiveness consistent with Canadian cultural norms. Canada’s current attitude towards engagement with the PRC suggests path dependency in the policies of Trudeau’s son Justin, the current prime minister. Much of Canada’s accommodation with China’s contemporary political and economic demands is related to a desire to diversify away from overdependence on the United States. In addition, due to historical factors and lucrative business engagements, there has been reluctance to acknowledge the threat of accommodation to Chinese demands to Canada’s democracy and sovereignty. The Canadian government is now actively participating in a two-year project, bankrolled by major corporations, entitled “Public Policy Forum: Consultative Forum in China,”3 whose purpose is to change Canadian public opinion in favor of a free trade deal.4 Nevertheless, at the popular level there are more and more reservations about the government’s desire for more political and economic integration with the PRC. In March 2010 the director of the Canadian Security Intelligence Service (CSIS), Richard Fadden revealed that there are several municipal politicians in British Columbia, and in at least two provinces, ministers of the Crown, who are persons of interest; CSIS believes these politicians are at least under the general influence of a foreign government5 seeking to “clandestinely influence Canadian politicians and policy at the federal, provincial and municipal levels.”6 The foreign government referred to was identified as China by Fadden, who further revealed that CSIS also has concerns over public servants under China’s influence.7 Consequently, Fadden was called to give evidence about his remarks to the House of Commons Standing Committee on Public Safety and National Security. Chan explained his motivation for entering provincial politics in 2007: “For me, it is how I am able to bridge Canada and China. I can be in a position to promote both jurisdictions for the benefit of the people. I think that’s important.” Two years after his election as a member of the Ontario Provincial Legislature, he travelled to Beijing to attend the military parade to mark the 60th anniversary of the PRC. He was quoted in Xinhua, “Great is my motherland, and great are the people of my motherland […] today, seeing the army on parade with such precision and the high spirits of the people, I am moved even more by the strength and power of my motherland.” Later Chan’s spokesman said that he could not have made such a statement to the Chinese press as Chan could not speak Mandarin at the time. But the Xinhua reporter Zheng Liu who wrote the piece affirmed to The Globe and Mail that it was a direct quote from Mr. Chan`s interview with him.16 Chan’s strong support for the application for Chinese government funding to establish a Confucius Institute to encompass all of the Toronto District school board was identified by the chair as “crucial” to the success of the application although he had no responsibility for education in his portfolio and his riding is not in Toronto. Chan demanded that Kenney apologize, threatening to take legal action against him. Chan also demanded an apology from The Globe and Mail19, saying it is “ludicrous” and “totally false” for Canada’s spy agency to believe he may be susceptible to Chinese government influence.20 When the apology was not forthcoming, he sued the Globe and Mail’s publisher, editor-in-chief, reporter Craig Offman, and occasional contributor of opinion pieces, Charles Burton, for defamation. The matter has yet to come to trial. After The Globe and Mail exposé was released, there was much support expressed for Chan by Liberal Party colleagues. Dwight Duncan, Ontario’s finance minister and deputy premier at the time CSIS brought the allegations to the province, took aim at CSIS for what he called a “smear” against “one of the most decent, honorable people I know.”21Ontario premier Kathleen Wynne characterized Chan as a man of “sterling character,” who had landed nearly $1-billion worth of investment from Chinese companies during a trade mission the previous fall. Evidently Chan is seen as highly effective in building a relationship with China, an important market for Ontario, and as an outstanding raiser of political donations from the Chinese community for the Liberal Party and facilitator of ethnic Chinese Liberal Party candidates for election at all levels of government.22 National security is not a provincial government mandate. Chan was subsequently promoted to Government of Ontario minister of international trade. In 2017, photographs of Justin Trudeau at fundraisers in the homes of Chinese-Canadians appeared in a newspaper in China published by the CPC’s Overseas Chinese Work Department. They showed him posing with Chinese-Canadian donors and with non-Canadian Chinese citizens, with the flag of Canada and the flag of the PRC prominent in the background.26 Over 80 guests got their pictures taken with Trudeau at the $1,500 per ticket event. Attendance figures suggested that the Liberal Party collected up to $120,000 per event from ethnic Chinese donors meeting with Trudeau in a private setting.27 One attendee, Zhang Bin, a political adviser to the Chinese government described as “a senior apparatchik in the network of Chinese state promotional activities around the world” with a partner later donated $1 million to the Pierre Elliott Trudeau Foundation (it is illegal for foreign nationals to make donations to Canadian political parties).28 This has led to concern that Canada-China economic integration, especially if Canada and China finalize a FTA, will increasingly lead to Canadian compliance with the business culture wherein Chinese businesspersons cultivate political patrons by giving politicians or their relatives gifts or benefits in kind. 1.6 million or 4.5% of Canada’s 35 million population identify as ethnic Chinese. Chinese is the third most spoken language after English and French. In August 2016, Dan Levin of The New York Times published an investigative report entitled “Chinese-Canadians Fear China’s Rising Clout is Muzzling Them.”29 Amnesty International produced a confidential report on Chinese state agents’ harassment of Canadians, the gist of which was reported by Tom Blackwell in The National Post in January 2018 under the headline “’Don’t step out of line’: Confidential report reveals how Chinese officials harass activists in Canada.”30 Both of these list tactics of intimidation against persons of Chinese heritage, especially those with family in China as well as against Canadian academics who write critically about CPC rule. A reporter from the Chinese-Canadian media who wrote critically about remarks by Foreign Minister Wang Yi, who denounced a Canadian journalist who asked about human rights while he was in Canada, and another who reported on allegations Michael Chan allege that they suffered consequences. One reports receiving death threats and another being fired under Chinese Government pressure. In general, the activities of agents of the Chinese state are claimed to have a chilling effect on Canadian-Chinese newspapers, radio, and TV. There are also allegations of suppression of distribution of the Epoch Times and difficulty in some neutral Chinese papers retaining advertisers. The Chinese government has strongly advocated a bilateral FTA, offering assurances of increased exports and narrowing the current 3:1 trade imbalance with China.36 But the asymmetry of relations with China and the incompatibility of institutions have raised concerns about potential threats to Canada’s national security. While the Canadian side focuses on promoting prosperity, Beijing understands economic integration as a tool to facilitate its overall geopolitical interests. Postulating collaboration between Chinese authorities, Canadian policy-makers, Canadian businesses active in China, and Canadian think tanks, partially supported by these businesses is still speculative. But while the think tanks tend to produce reports urging much more Canadian collaboration with China on Chinese terms and key political figures and senior civil servants who on retirement have been appointed to lucrative boards of Chinese or China business-associated firms or as well-paid advisers to law firms connected to companies with close relations to Chinese business networks does not indicate any formal agreement between them and agents of the Chinese state. There is no evidence of China promising to generously reward Canadian officials after they leave government service if they support the PRC’s agenda in Canada in their official capacity. China has the largest diplomatic delegation to Canada–169 compared to the United States with 138 many likely engaged in activities related to the Chinese Minister of State Security or the Party’s United Front Work Department. It is incumbent on the Government of Canada to devote more resources to ensuring that Chinese diplomats do not engage in activities inconsistent with their diplomatic status and that agents of the Chinese state engaged in illegal activities be subject to account by judicial process based on a body of law that clarifies the “grey areas” of acceptable and unacceptable activities by those seeking to promote the interests of the PRC in Canada. 1. Peter O’Neil, “Canada Must Get Serious about Its Relationship with China: Transition Document,” Vancouver Sun, October 2, 2015. 2. Justin Trudeau, “Why the CNOOC-Nexen Deal Is Good for Canada,” Justin Trudeau, 2012, https://justin.ca/justin-trudeau-why-the-cnooc-nexen-deal-is-good-for-canada/. 3. Public Policy Forum, “Toward ‘Eyes-Open’ Engagement with China,” PPF Consultative Forum on China (blog), June 20, 2017. 4. Robert Fife and Steven Chase, “Think Tank Leads Corporate-Funded Campaign to Sway Canadians on Chinese Trade,” The Globe and Mail, June 20, 2017. 5. Statement by Richard Fadden at the Royal Canadian Military Institute, March 24, 2010, broadcast on Canadian Broadcasting Corporation television news program “The National” on June 22, 2010. 6. Joanna Smith, “Memo Names Politicians Feared under Foreign Influence,” Toronto Star, October 15, 2010. 7. Richard Fadden, “Web Exclusive: Full Interview with Richard Fadden,” “The National” CBC Television News, June 22, 2010. 8. Richard Fadden, “Richard Fadden on As It Happens,” CBC Radio, April 4, 2016. 9. Standing Committee on Public Safety and National Security House of Commons Canada, “Evidence,” July 5, 2010. 15. Craig Offman and Nathan Vanderklippe, “CSIS Warned This Cabinet Minister Could Be a Threat. Ontario Disagreed,” The Globe and Mail, June 16, 2015. 16. Craig Offman, “The Making of Michael Chan,” The Globe and Mail, June 17, 2015. 17. Michael Chan, “The Problem That’s Been Around for 40 Years,” The Globe and Mail, June 9, 2016. 18. Craig Offman, “Ontario Minister Michael Chan Defends China’s Human-Rights Record,” The Globe and Mail, June 8, 2016. 19. Craig Offman, “Ontario Minister Chan Demands Globe Apologize for Reports of CSIS Warning,” The Globe and Mail, June 22, 2015. 20. 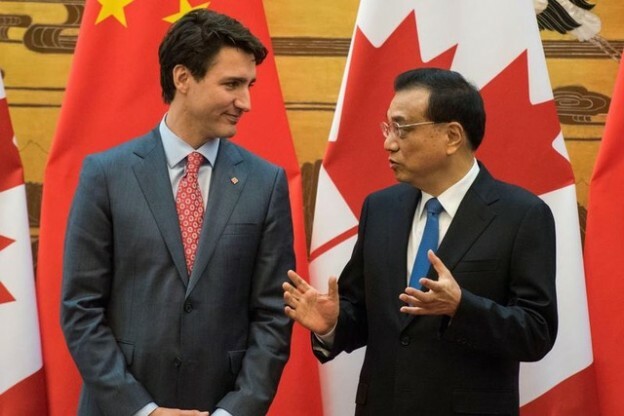 Adrian Morrow, Adam Radwanski, and Steven Chase, “Liberal MPP Michael Chan Calls CSIS Concerns about China Ties ‘Ludicrous,’” The Globe and Mail, June 15, 2015. 22. Charles Burton, “The Murky World of Chinese Influence,” The Globe and Mail, June 17, 2015. 23. Standing Committee on Public Safety and National Security House of Commons Canada, “Report on Canadian Security Intelligence Service Director Richard Fadden’s Remarks Regarding Alleged Foreign Influence of Canadian Politicians,” March 30, 2011. 24. Jeremy J. Nuttall, “Parliamentarians Ignore Blockbuster Paid Travel Revelation,” The Tyee, December 6, 2017. 25. Robert Fife, Steven Chase, and Xiao Xu, “Beijing Foots Bill for Canadian Senators, MPs to Visit China,” The Globe and Mail, December 1, 2017. 26. Jeremy J. Nuttall, “Tyee Report Lands Trudeau in Hot Seat Over ‘Cash for Access’ Fundraiser,” The Tyee, November 29, 2016. 27. Robert Fife and Steven Chase, “Influential Chinese-Canadians Paying to Attend Private Fundraisers with Trudeau,” The Globe and Mail, December 2, 2016. 28. Robert Fife and Steven Chase, “Trudeau Attended Cash-for-Access Fundraiser with Chinese Billionaires,” The Globe and Mail, November 21, 2016. 29. Dan Levin, “Chinese-Canadians Fear China’s Rising Clout Is Muzzling Them,” The New York Times, August 27, 2016. 30. Tom Blackwell, “‘Don’t Step out of Line’: Confidential Report Reveals How Chinese Officials Harass Activists in Canada,” National Post (blog), January 5, 2018. 32. James Bradshaw and Colin Freeze, “McMaster Closing Confucius Institute over Hiring Issues,” The Globe and Mail, February 7, 2013. 33. CAUT Bulletin January 2014, “Canadian Campuses Urged to End Ties with Confucius Institutes,” CAUT Bulletin Archives 1996-2016, December 17, 2013. 34. “Clubs and Community,” Confucius Institute at Brock University, accessed March 5, 2018,https://brocku.ca/confucius-institute/clubs-community/. 35. “联邦参议员胡子修与尼亚加拉华商会在圣凯Sushi Ai商务座谈 – 加华空间,” 加华空间 (blog), accessed March 5, 2018. 36. Asia Pacific Foundation of Canada, “Canada’s Merchandise Trade with China,” Asia Pacific Foundation of Canada, accessed March 5, 2018. 37. Steven Chase and Robert Fife, “Critics Oppose Liberals’ Handling of Chinese Investor’s Norsat Takeover,” The Globe and Mail, June 8, 2017. 38. Charles Burton, “Engaging China Poses Potential Risk to Canada’s National Security: Charles Burton for Inside Policy,” Macdonald-Laurier Institute (blog), July 7, 2017. 39. Steven Chase and Robert Fife, “China’s Premier Urges Trudeau to Relax Controls on High- Tech Exports,” The Globe and Mail, April 18, 2017. 40. Andy Blatchford and Mike Blanchfield, “China Sees Free Trade with Canada as Way to Avoid Future Norsat-like Uncertainty,” CBC News, July 5, 2017. 41. Steven Chase, “Liberals Reverse Course on Chinese Takeover of Montreal High-Tech Firm,” The Globe and Mail, March 27, 2017. 42. Steven Chase and Robert Fife, “Liberals Waive Security Review for Chinese Takeover of High-Tech Firm,” The Globe and Mail, June 8, 2017. 43. Charles Burton, “Burton: Canada Must Smarten up on Its China Policy,” Ottawa Citizen, February 13, 2018. 44. Ann Hui, “What’s Really behind China’s Decision to Restrict Canola: Science or Politics?” The Globe and Mail, August 30, 2016. 45. Jeremy J. Nuttall, “Forum on Trade with China, or Propaganda Campaign?” The Tyee, accessed March 6, 2018. 46. “Canada-China Session 1: Setting the Stage, Public Opinion Trends, Approaches to Trade,” Public Policy Forum (blog), accessed March 6, 2018. 47. Mike Blanchfield, “‘Progressive’ Canada-China Trade Deal Held Up,” The London Free Press, accessed March 6, 2018. 48. Global Affairs Canada, “Foreign Representatives in Canada: Diplomatic, Consular and Other Representatives in Canada Publication,” June 7, 2006.